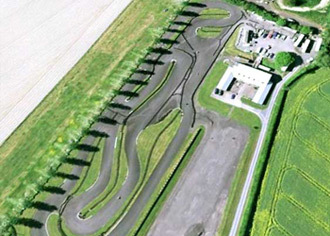 Kinsham Raceway is Herefordshire's largest Premier Outdoor Hire Karting Circuit. Established in 1990, the circuit is situated near Presteigne on the Herefordshire/Powys border, providing an easily accessible venue for anyone based in Herefordshire, Worcestershire, Shropshire, Powys and the West Midlands. The purpose-built asphalt circuit is 900 metres in length with a minimum track width of 7.5 metres. The design provides for maximum exhilaration and excitement, featuring banked and adverse camber bends, high-speed corners, hairpins and chicanes combined with many elevational changes. Open all year, the Circuit provides both enjoyment for beginners whilst providing a challenge for experienced drivers. Offering superb views of the surrounding Herefordshire countryside, the venue ensures an enjoyable day for all, with a sheltered viewing area for those wishing to spectate. The venue also offers practice facilities for owners of Hire Karts, Pitbikes, Minimotos and Supermotos, together with private circuit hire. Head north toward Dishley Street/B4361 then turn left onto Dishley Street/B4361. Turn left onto Bargates/A44 and follow the A44 through 1 roundabout then turn left onto Monkland Road/A44. Continue to follow A44, turn right to stay on A44 then turn right onto Bridge Street. Turn right again toward B4362 then turn left onto B4362. Visitors are advised to approach the circuit via the B4362 to Combe, then follow the signpost to Kinsham village and avoid the C1101 road through Byton.